The storyline of The Briar King is fantastic. I enjoy fantasy plots with a doomsday prophecy and characters who have no idea what they’re getting themselves into. There are the stereotypes that one comes to expect in this sort of novel: stubborn, hot-headed princess, naive priest, brave knight, cynical woodsman, etc. 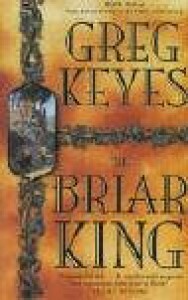 However, I think there are quite a lot of unique elements to the story, and the imagery of the Briar King thoroughly creeped me out. What really sold me at the end was how everyone’s stories start fitting together. Despite this, I found this book extremely difficult to get in to. The writing gets progressively better throughout the book, but the beginning was tough going. It reads like a middle-grade novel instead of adult fantasy. There’s very simplistic narrative, unrealistic dialogue (and a lot of it! ), and many of the characters aren’t likeable at first. At about three-quarters of the way in, the plot gets moving and the characters get better. I think it’s because they have to deal with real problems instead of whining about trivial things. I’m not sure if it’s worth investing in this series yet, considering that it doesn’t become good until the later part of the first book. There are three more books, and if these three are anything like the last part of The Briar King, I think it will be worth it. The ending of this book is definitely enough to keep me reading more, but the sequel has to be very good for me to continue with this series all the way.